A lot of fans of old school superhero comics complain about how current Marvel and DC superhero titles are too dark and not any fun. While that may be true of their big crossover events in particular, there are a few genuinely bright spots in their current lineups, and one of the most fun of those just received its first collection: The Unstoppable Wasp -- Unstoppable! 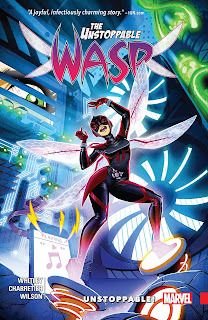 "Unstoppable" collects the first four issues "The Unstoppable Wasp" and "All-New, All-Different Avengers" #14, and introduces Nadia, the teenaged daughter of (currently dead) Hank Pym and his first wife, Maria Trovaya. Nadia was trained in the Red Room, the same Soviet/Russian/whatever-they-are-now training facility that trained Natasha Romanoff, the Black Widow, but is more than an assassin. She is also a brilliant scientist in her own right, determined to follow in what she sees as her father's noble scientific footsteps. Unlike most characters who were trained to assassins in secret facilities (and there are a surprisingly large number of these characters across all media these days), Nadia is not grim and tortured, although her past weighs heavily on the events of the series. She is relentlessly positive and optimistic, ebullient in her love of science and adventure! Mentored by the Avenger's former butler, Jarvis, and Janet van Dyne, the original Wasp and Hank Pym's second wife, Nadia sets out to assemble a team of like-minded teenage girls devoted science and technology, while dealing with typical Marvel issues like supervillains, assassins, and ghosts from Nadia's past. Jeremy Whitley's writing is bright, crisp, and positive, moving at an enjoyably brisk pace. Whitley's previous work includes writing "My Little Pony" comics and a series called "Princeless". Elsa Charretier's artwork is clean and dynamic, with a European vibe (unsurprising as she herself is French) and wonderful character acting. She handles character scenes and action, comedy and violence, with equal aplomb. Charretier's previous work includes "The Infinite Loop" for IDW and "Starfire" for DC Comics. If any of the above sounds appealing to you, pick up this first collection of "The Unstoppable Wasp" and I think you'll be hooked on Nadia's adventures.